"Disappointing daygame guide from Lovesystems"
Very simple to understand - perhaps aimed at novices with no prior game exposure. Too light on content - no real routines, nothing for different daytime environments. Vague advice without much specifics. For a daygame system, lovesystems have missed an opportunity. - go with Sinn instead! first let me say – I love love systems products. Ive happily purchased magic bullets, routines manual 1 and 2 and text / phone game and would happily recommend them to others. Ive been waiting for the lovesystems guide to day game for a long time and eagerly downloaded it on the day of release, immediately opened it up and starting reading. 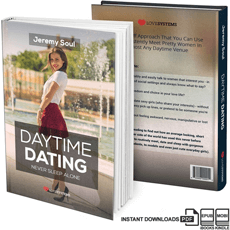 However, very quickly I see that souls daytime dating is not in the same league as the previous books. Long on filler - pages and pages explaining basic concepts and rehashing material in other books – eg the emotional progression model from magic bullets is again gone over in detail. short on specifics – almost no routines at all. Soul may be the greatest daytime PUA but he doesn’t let us see inside his box of tricks. instead we get only vague outlines. Start with a compliment, then ask her about work. For me, I wanted to see specific routines adapted for different environments such as supermarkets, malls, restaurants, music stores, bookshops, stations.. These places are only mentioned in passing and there are no specific routines given for approaches and escalations in these environments. For someone who has read and appreciated love systems earlier works, the useful material here could be condensed to maybe 2 or 3 pages! I feel that the book is aimed really at the novice with no experience of dating science. I feel that Love Systems and Soul have missed an opportunity – move over Soul, Im going with Sinn. Soul saves goes into immense detail in his Daygame workshop currently priced at $2997. you need to never sleep alone." attend my workshop for only $3,000."